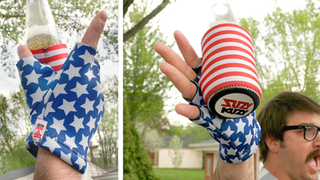 If there was ever a time to get a Suzy Kuzy, the ridiculous all in one glove and beer cooler, it’s for Fourth of July Weekend. Bro-out for cheap and celebrate our nation’s independence using promo code JAL50 and save 50%. That’s just $9.99. It’s weird and ridiculous, it’s a Suzy Kuzy. Grab one at 50% off using promo code JAL50 and then grab a cold one.